It's the new directory launch at our AGM this evening, at Ryedale Folk Musuem, 7pm. I have, along with our Vice Chair Andy Dalton, spent the best part of two days preparing for this. Last week we were writing the Report to Members and today I have been printing paperwork and generally gathering things together for tonight. I have always kept copies of old directories and other printed material relating to RAW for our archive and today I gathered some together because it occurred to me that new members would be particularly interested in seeing how we are developing. I found a plastic box to put them in but I think a properly labelled box file is called for in future. Four years, four directories! I think perhaps we should have cake next year. . .
Because we have over 11 boxes of the old directories left from last year; they were not collected for distribution, we made the decision to reduce the numbers available to individual members and have the rest delivered by Northern Print Distribution. A huge weight off our minds, particularly as we will receive detailed data on uptake. The use of NPD has been possible because, for the second year running RAW have been successful with our bid to Ryedale District Council's Creative Commissioning Board. The Commissioning Board has finished its work at the council and the work and activity is now being managed by the Policy and Resources Committee, chaired by Cllr Mrs Linda Cowling, also leader of the Council. 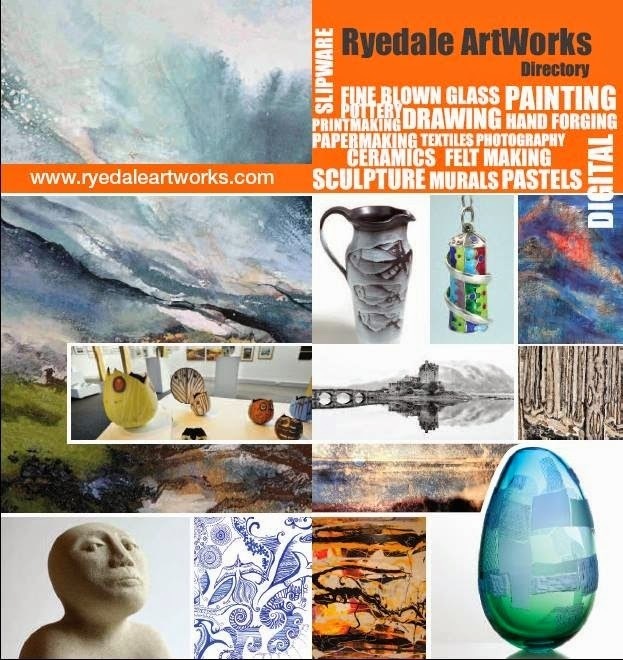 We are looking forward to hosting a visit by Janet Waggott, Chief Executive of Ryedale District Council at my studio on 28th May. 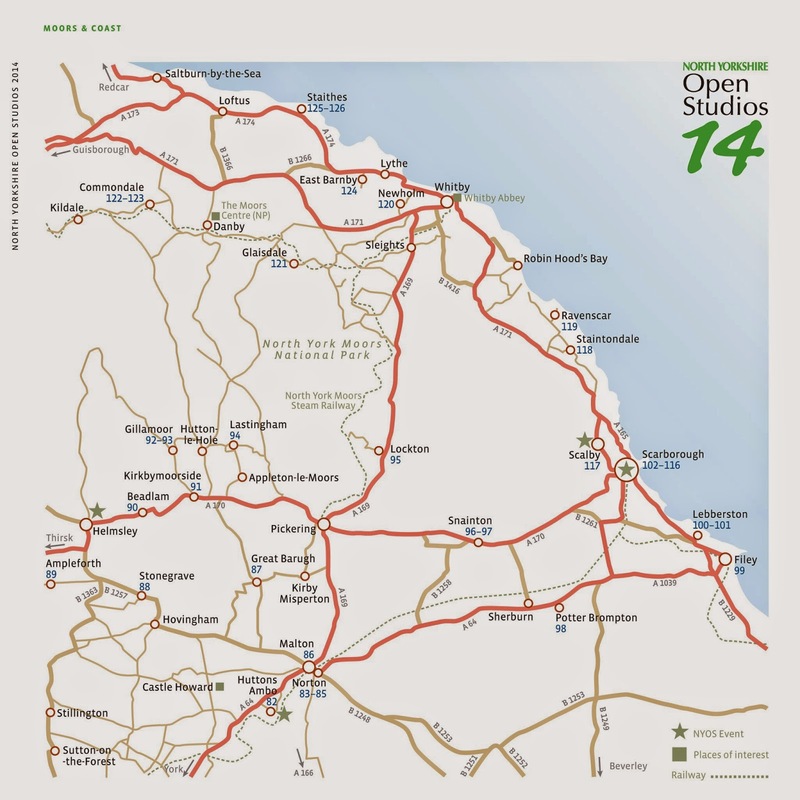 A visit to my studio on that date is probably a good thing; North Yorkshire Open Studios 14 begins in June. This means I will have to be tidy and ready! I have sort of been in denial about the whole event up to now; nothing done at all. I am riding the wave of panic at the moment; family things and needing to be at home for builders and all tasks related has prevented me from getting out to the studio. I STILL have not made any prints! But I will. . .
Fortunately, I do have quite a lot of work that nobody has seen, so I can display that and have some printmaking on the go during the opening times if I don't achieve any new work by then. It's my first attempt and, given the lack of time I've had to prepare, I am beginning to wonder if I should have left applying until next year but as the old saying goes: "nothing ventured, nothing gained"! My studio is just outside the village of Stonegrave, to the left of the map, between Helmsley and Hovingham. It will be well signposted so you won't miss me! As I prepare, I will post photos and info for any of you reading this who are interested. NYOS 14 is part of Yorkshire Festival 2014 and you'll find info and links within their rather lovely brochure too.